After 11h on the road and a few detours for construction, we were ready for action. We realized that the best party in NYC that night was actually in Long Island, so we burned it up to the coliseum. I got so excited as we approached the parking lot. I had no expectations other than hanging outside and taking in the carnival that I missed so much. I knew that MSG wouldn't have the same kind of lot so I was extra glad we made it down. It was a pretty colourful scene: lots of folks hocking their wares, the gorgeous buses... much like I remembered it. Lots of balloons, the sound of which somewhat grates on my nerves. This lovely woman is displaying some pretty incredible works of art - imagine the potency! After a bit of exploring, one of my new comrades on the journey convinced me that it was time to go inside. We made it in time to hear the end of Saint of Circumstance - our urge to GO FOR IT was being reinforced by the whole arena. One of those moments where you know you're in the right place at the right time. it was great to be back inside, in my favourite spot - side stage. Love checking out the band in profile and all their gear. Spent setbreak talking quite a bit with the people seated around us. There was a local usher who was glad to see the Dead back again - "Why do you think I wanted to work tonight??!!" I caught her dancing on the job. "People can be kind, but there's too much drinking here - people turn into shitheads". In general it was a great, comfy scene and I felt right at home in Long Island. The devotion to the band was palpable - not unlike the fervour over sports teams. And the Dead are one of their favourite teams! That first night we partied in the Roach room with some excellent heads from Memphis via Cali - beautiful '60s vintage schoolbus drove them all the way. We jammed all night to the delight of our hosts - mucho debauchery and never a complaint. What a great place to stay! We were on a 3rd story balcony just to the right of the Chelsea sign. I HIGHLY recommend it. Next day was show day and we were all stoked. Not even tired after our long journey and jamming all night, we were just flying off euphoria. 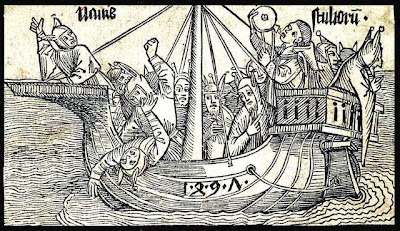 We walked ourselves downtown and to the harbour to get on board what turned out to be the best idea of the trip: the Ship of Fools. This was a genius idea and a lot of fun. Heads, booze, and the Hudson River. A DJ was spinning some choice cuts and the jams were churning while we were bobbing along. Saw the city as it's meant to be seen... from the water. A natural harbour, it's easy to see why early explorers would want to settle there. It's great to see all the activity in the harbour. Ellis Island has a way larger building than I imagined, and the Statue of Liberty is also quite imposing. Gave new meaning to Liberty seeing her like that - I think we were all having a moment thinking about what it meant to us. Americans, Canadians, liberty is an important concept and we were all excercizing our rights and freedoms that day. Thanks to the French for such a beautiful and meaningful gift. By the end of the cruise, we were looking a little like this... except more tame. Everybody got used to the sway and we were well-prepared for the bouncing to come at MSG. Out front, things were getting busy. 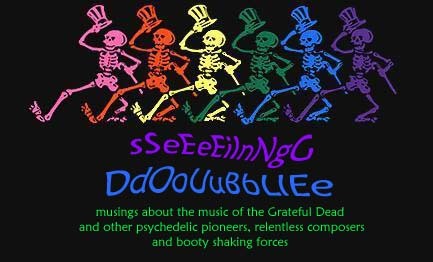 Reminds me of my first time trying to see a Dead show, at MSG in '91, I was also taking my first acid trip and milling about the buzzing crowd trying to find a way in. Didn't make it, so now I could finally complete my mission. 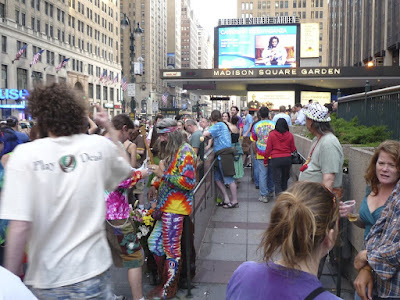 The tie-dyed hippie in the centre of the picture is Roach - we partied with him in the Roach room the night previous. There was a musical bus out front - the First Aid bus we'd seen the night before at Nassau. A Beeeoootiiiifullll noise emerged. 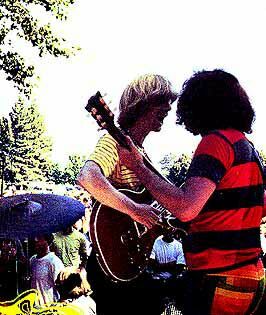 One more shot of my man, Mr. Lesh, really givin'er inside the Garden. We were well lubed and our sea legs really helped us get our groove on. 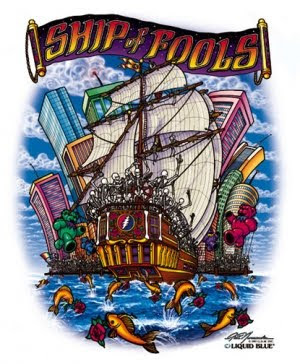 I couldn't help but think that the only Ship of Fools of the Tour was played that night for us... A nice shout-out to all who went on the cruise and to the beautiful harbour that is such a distinct aspect of the city. 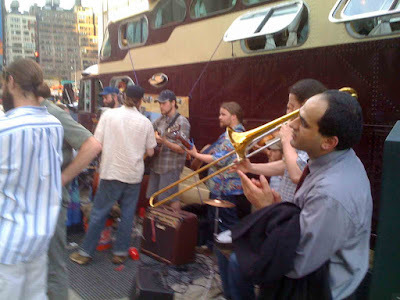 We celebrated the next day with a visit to Central Park - Strawberry Fields and then a jam with the company. My friends rock! Passers-by were amused, it was one of the first beautiful Sundays of the spring and families were out in full force to picnic in the park. It's quite a gorgeous place and immaculately kept. Not a piece of garbage did I see. We drove back Sunday and made it home in good time, safely and much better for the journey. Except that I lost my voice for a week after screaming so hard in MSG. That was one loud crowd.